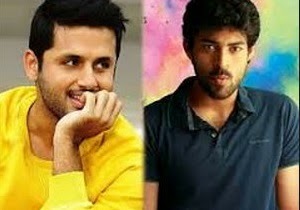 Home / Chinnadana Nee Kosam / Collections / Movie News / Mukunda / Nithin / Varun Tej / Mukunda vs Chinnadana Neekosam!! Nithiin's 'Chinnadana Neekosam' and Varun Tej's 'Mukunda' were released this week. According to the trade numbers, Nithiin's 'Chinnadana Neekosam' is stable at the box-office while Mukunda’s collections have started to drop from the second day. Mukunda collected close to 4.5 crores (Share) in two days but the 2nd day collections are very less compared to day one. On the other hand, ‘Chinnadana Neekosam’ collected 2.7 crores (Approximately) and the film has done exceptional good on its second day as well. This film is minting money in the Nizam area and is decent in other areas too. Mukunda is getting good numbers only in some ‘A’ centres and multiplexes. Though both the films opened up with mixed reviews, Nithin’s ‘Chinnadana Neekosam’ is likely to perform much better than ‘Mukunda’ at the ticket window, says the trade analysts.